The company has quoted higher growth rate than BMW India, as competition intensifies in the luxury segment. One day after BMW India posted growth rate figures for the first three quarters of 2017, Mercedes-Benz India has also posted its sales figures, which are incidentally buoyed by the E-Class Long Wheelbase. The Mercedes-Benz E-Class LWB is the direct rival to BMW’s new 5 Series, which was quoted by BMW to be the key model in its India portfolio. Mercedes-Benz India has quoted 41% higher sales in Q3 2017 in comparison to Q3 2016, and affirmed that the E220d Long Wheelbase edition, launched in India earlier this year, has been key to the higher sales figures that it has managed to achieve. The company has made a number of launches this year, including the more mainstream yet evolved GLA SUV lineup with a new infotainment system, the high performance AMG GT-R and even a niche GLC43 4MATIC Coupe performance SUV. The Mercedes-Benz GLC lineup happens to be the company’s highest selling SUV line in India, behind the C-Class sedan. While BMW’s upgrade of its 5 Series sedan has been more radical, Mercedes Benz has focused its technology upgrades more to the rear seat. The E220d has taken cues from the venerable S Class to now include reclining rear chair, and even allow the passenger to push the front passenger seat forward, thereby getting more space to oneself. BMW, however, has provided more gizmos, with a more comprehensive rear seat entertainment package. 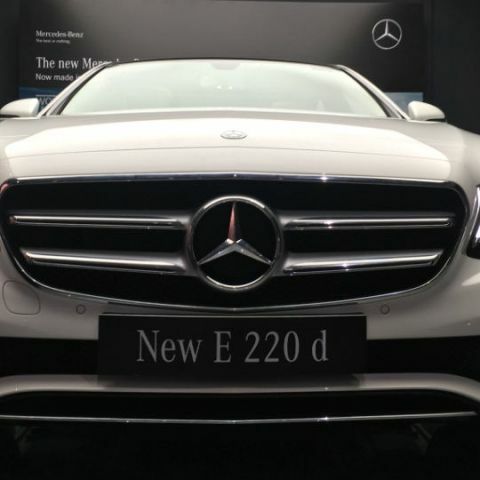 Mercedes-Benz, meanwhile, has provided all the technology up front, and it also happens to include Android Auto and Apple CarPlay – presets that BMW has not carried in its ConnectedDrive setup yet. With these reports, the competition in the luxury segment now seem more intense than ever. Audi, the third German giant, launched three new cars yesterday, and the likes of Volvo, Jaguar and Lexus are not too far behind in terms of the overall packages, either.